We've helped thousands of clients to have their UK and Irish documents legalised, and haven't once had a document rejected in Egypt. In fact we're so confident in our service that we offer a 100% acceptance guarantee. We offer multi-document discounts when we are attesting more than one UK or Irish document at the same time. If you need an individual quotation, please click on the 'Request a Quote' button or simply order online below. 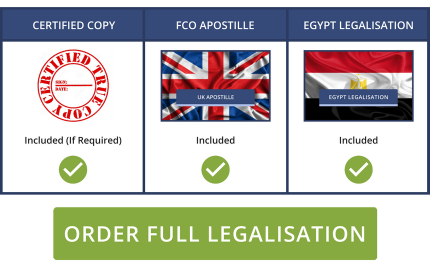 Using our Egypt legalisation service gives you complete peace-of-mind and ensures that you get what you require in a timescale to suit your needs. Our friendly and expert team have years of experience and deal with the Egyptian Embassy in London on a daily basis, so they're fully aware of the steps required to make sure your certification goes smoothly. To begin, please select one of the options below. 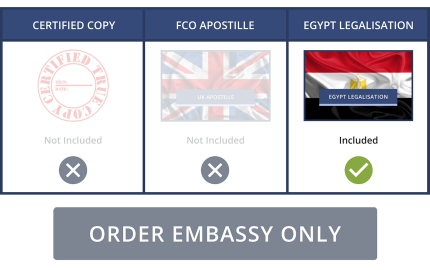 If your document needs an Apostille Stamp by the Foreign and Commonwealth Office (FCO), or by the Department of Foreign Affairs in Dublin, select the option on the left. If it doesn't, please select the option on the right. Alternatively, you can fill in our enquiry form or contact us. Please be aware that due to unforeseen circumstances, Irish documents are taking longer to legalise. Please allow up to one extra week for the legalisation of an Irish document.